Materials Assembled: Ready to begin box production. I've made great progress on the Pi box production in the past couple of weeks. 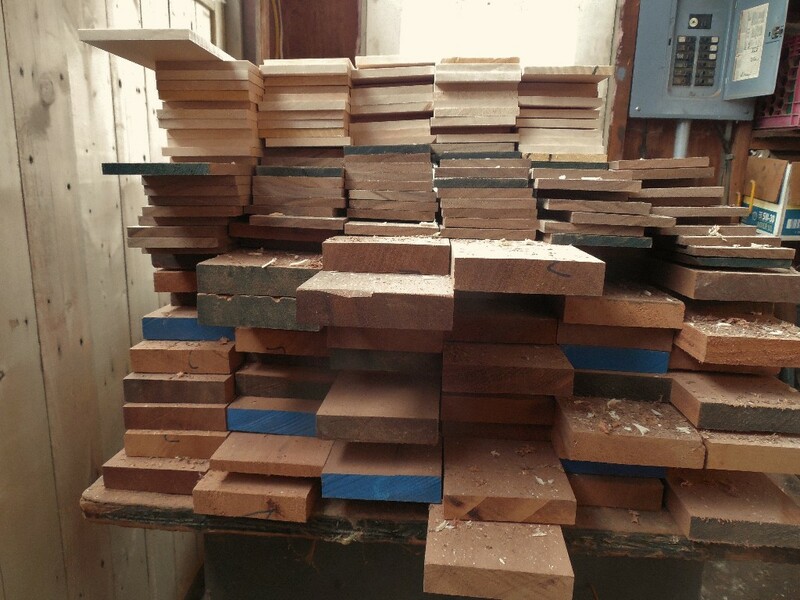 I have all of my Mahogany, Walnut, Curly Maple, Cherry, Purple Heart, and Mexican Ebony pieces planed to perfect thickness (it was very much fun doing this with my new Powermatic planer!). The cost of the lumber for this project has already set new records for any production run I've ever done. I decided to go ahead and try for 50 puzzle boxes for this limited edition. That's a lot of boxes! I felt a little sorry for the people who contacted me after my last run of puzzles had sold out so I wanted to make a few more than I thought would sell immediately. Each extra puzzle added also brings down the individual price because a higher number of boxes will capitalize on production techniques. There comes a point where I would be making more than I could ever sell but this box is probably the coolest puzzle I've ever made and I'm pretty confident I will eventually be able to find fifty people who would really like to have this puzzlebox. I seem to be way ahead of schedule so far and I'm really hoping I can keep the momentum going as I start to cut and fit individual parts together....time will tell. I have to watch machining tolerances very closely because with fifty plus boxes to make even one extra minute each will cost me an extra hours work! So all in all I'm a little antsy about the near future but I couldn't be happier with the way things are going now. 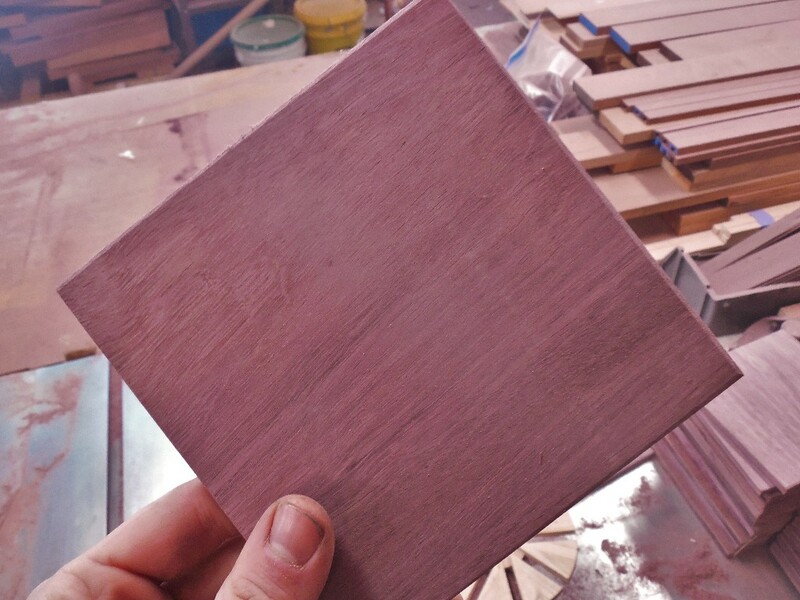 This Purple Heart piece will soon become the key to a Pi box. The most interesting change in the design over the past couple of weeks is the addition of my self-made wood hinges. The top of the Pi box is a nonagon and would seem to be somewhat obtrusive with a hinged opening but I've found the hinges really set the box off nicely and also help to tie up some lose ends elsewhere. Walnut lumber for lining the inside. 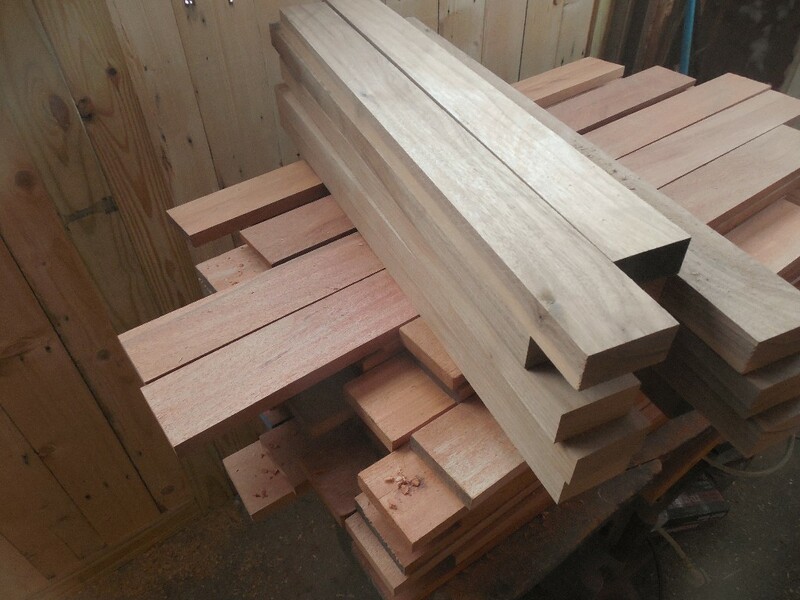 I've dimensioned all of my lumber and resawn and planed the various components to the perfect thickness. Right now I'm double checking my methods before I move to stage two and begin making individual parts.